When you or a family member is needing medical treatment after hours, do you know your options? 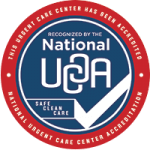 We’ve found that there has been a lot of confusion regarding urgent cares and emergency rooms visits. Watch our short video blog to find out more! There are several differentiating factors to consider. Did you know that Advanced Urgent Care and Occupational Medicine can treat most of the acute illnesses? We offer medical treatment for: upper respiratory infections, sinus congestion, sinus infection, cough, throat infection, fever, headaches, earaches and ear infections, eye pain and eye infections, minor stomach pain, vomiting and more!